Supervisors Chris Daly, Ross Mirkarimi and Sophie Maxwell joined advocates for a rally in front of City Hall yesterday to make public that the Board of Supervisors condemned the“Border Protection, Antiterrorism, and Illegal Immigration Control Act of 2005.” San Francisco will not enforce any of the provisions, perhaps the most troubling of which being that anyone present illegally in the U.S. would be a criminal. The federal government can withhold funding to cities like San Francisco who will not participate. 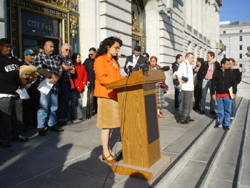 Supervisor Chris Daly introduced the legislation recommitting San Francisco to “providing a safe, healthy and dignified place to live, regardless of immigration status.” He vowed that the City would continue to support the Day Labor Program, one of the city organizations who would be most impacted by the Act. One provision of the bill HR4437 is that an “unlawful presence” in this country would be a felony charge, which would make it basically impossible for illegal immigrants to change their status. And those who assist illegal immigrants could be charged and punished with up to five years in prison. “This is an enforcement only bill. It criminalizes people and it is simply impractical,” said Ronen. Those seeking an asylum and are caught for any minor crime will be denied residency and citizenship. Anyone caught along the border who may be a victim of a crime, including children, will be detained and deported. Those who have served their time may be detained longer if they are defined as a “dangerous alien.” The Department of Homeland Security will have to build a 700-mile fence along the Southwest border at the places where the most immigrant death occurs. Also, immigrants may be deported rapidly, within 14 days of coming to the U.S., without going before a judge. A lottery program that allows 50,000 immigrants into the country each year will be terminated. On December 16, 2005 the House of Representatives passed the bill submitted by Republican James Sensenbrenner from Wisconsin and Chairman of the Judiciary Committee.